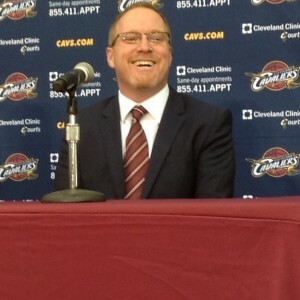 CLEVELAND – The Cleveland Cavaliers and Anderson Varejao have signed a multi-year contract extension, Cavaliers General Manager David Griffin announced today from Cleveland Clinic Courts. Per league policy, terms of the contract were not released. 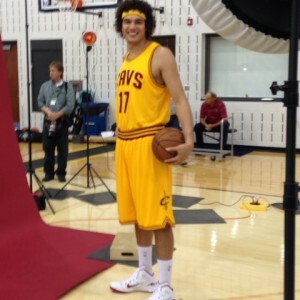 Varejao, who is in his 11th season, has spent his entire NBA career with the Cavaliers, appearing in 535 games (183 starts) with averages of 7.8 points on .512 shooting, 7.8 rebounds, 1.2 assists and 0.9 steals in 25.9 minutes. He has also appeared in a franchise-record tying 71 postseason games and was a key contributor to the team’s first ever trip to the NBA Finals in 2007. Among franchise leaders, Varejao ranks third in offensive rebounds (1,401), fourth in total rebounds (4,177), fifth in defensive rebounds (2,776), eighth in steals (500), eighth in blocks (377), eighth in field goal percentage (.512) and ninth in games played (535). He is just one of only four players in Cavaliers history with at least 4,000 points and 4,000 rebounds, joining Zydrunas Ilgauskas, Brad Daugherty and John Williams. Varejao has notched 88 double-doubles over his career and has pulled down at least 7.0 rebounds in seven straight seasons, including 9.0 rebounds in each of the past four campaigns. Last season, the Brazilian native appeared in 65 games (29 starts) for Cleveland and averaged 8.4 points on .495 shooting, a team-high 9.7 rebounds, 2.2 assists and 1.1 steals in 27.7 minutes per game. Among Eastern Conference leaders, he ranked fourth in rebounds per game (9.7, 13th in NBA), sixth in offensive rebounds per game (2.9, 15th in NBA) and sixth in defensive rebounds per game (6.8, 15th in NBA). He also tied Rick Roberson’s team record (3/4/72) with 25 rebounds to go along with 18 points and three assists in a win over Orlando on Jan. 2. 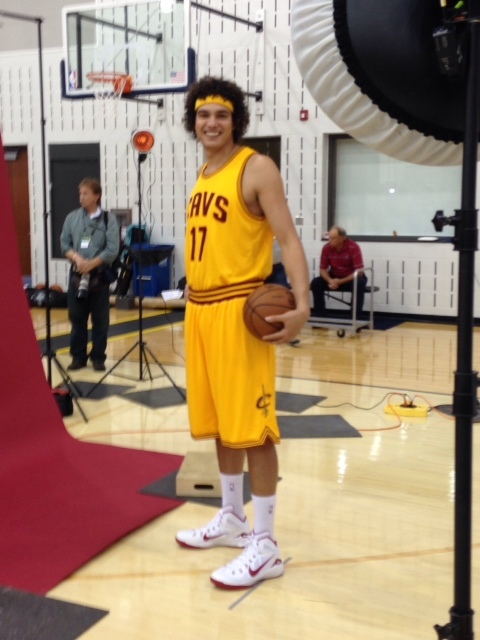 Varejao matched his career high with 16 double-doubles in 2013-14, while recording at least 10 rebounds 30 times, including a pair of 20-rebound performances. His best stretch came in 21 contests from December 26 through February 9 when he averaged 10.0 points, 12.6 rebounds, 3.3 assists and 1.2 steals in 32.4 minutes. 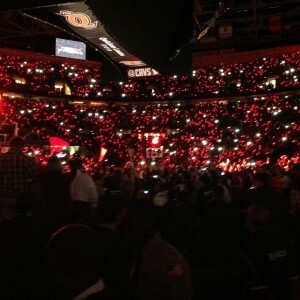 The day, the night and the event was so special and far bigger and more important than the outcome of the game itself. 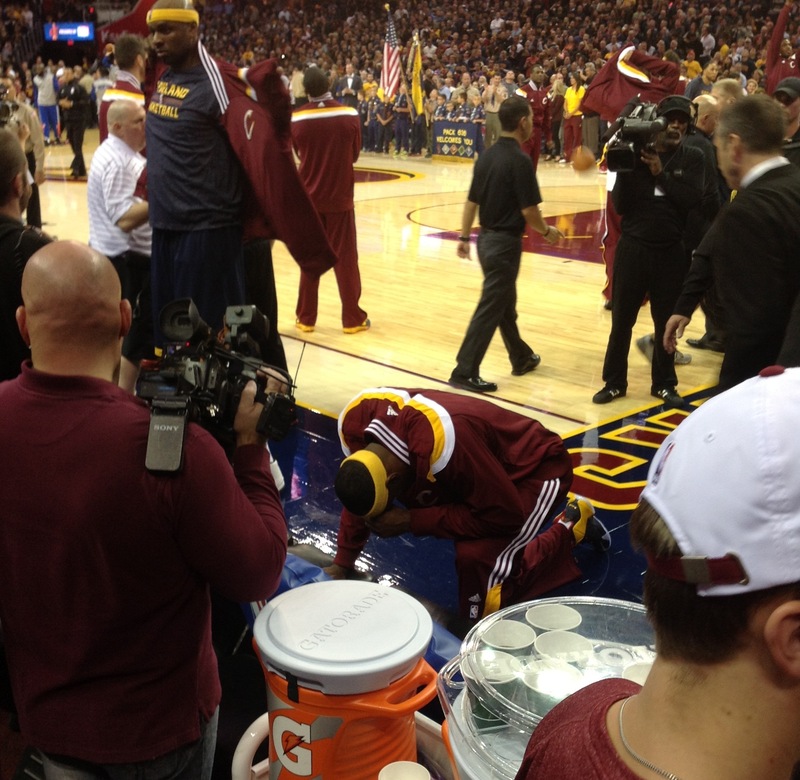 Yes it sucked the Cavs lost 95-90 to the Knicks, but after standing near LeBron in pregame warmups and seeing him soak in everything just like you the fans did, and then interviewing him in the locker room postgame, you could tell how much being back home and the night meant to him. All of the emotions LeBron felt last night, even for a superstar of his magnitude, it had to affect his focusness and ability to play his normal game, and by his standards, he was terrible last night in the contest (5-15fg for 17 points with 8 turnovers). 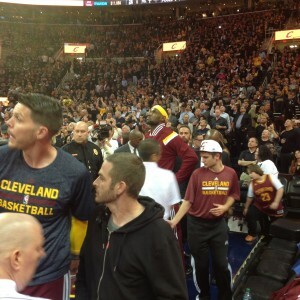 Add on top of that he and his wife Savanah had a baby girl about week ago, it’s been a crazy week even for “King James”. Being part of his postgame press conference and asking a lot of the question because it seemed like some reporters were afraid to ask questions because the Cavs lost and LeBron played so poorly, I sensed that LeBron knew how special the night was, he enjoyed it, was disappointed in his play, but realized the game wasn’t the most important thing on this night. Coming home was! 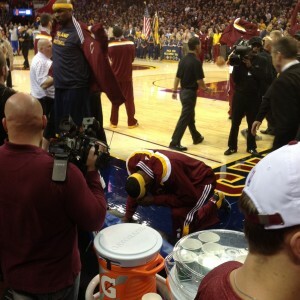 He was mentally and physically drained after last night’s game. With that out of the way, he and his teammates can fix what they did wrong on the court and now just play basketball. 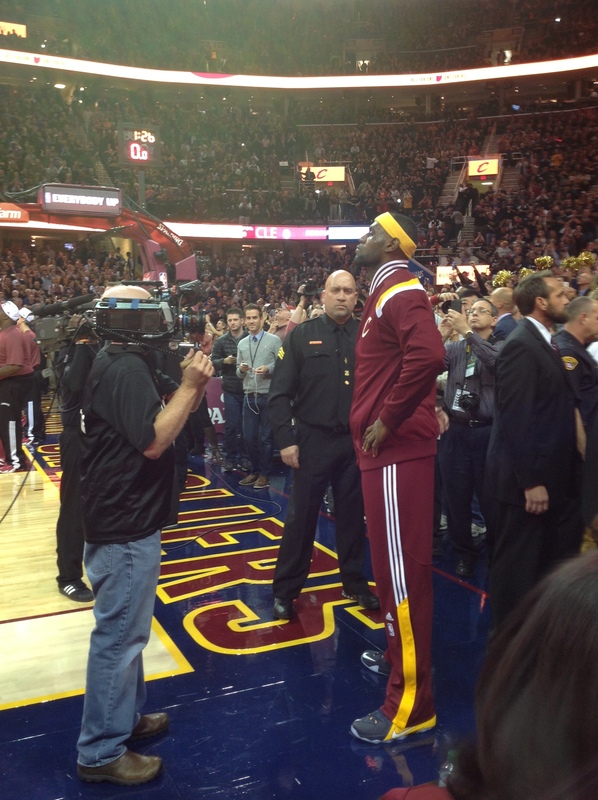 The atmosphere inside Quicken Loans Arena before the game was unlike any other regular season game and very NBA Finals like. It really was truly amazing. 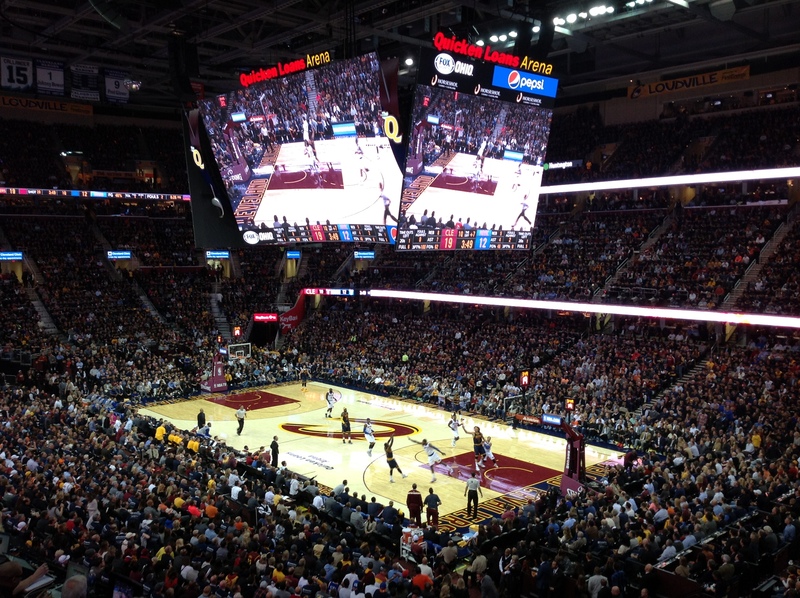 The Cavaliers issued over 300 media credentials, the most ever in either LeBron era for a regular season game, including even when LeBron came back for the first time with the Miami Heat in 2010. Usher did a nice job with the National Anthem, but what made it so memorable was the entire crowd singing it for about the last thirty seconds. It was a goosebumps moment. 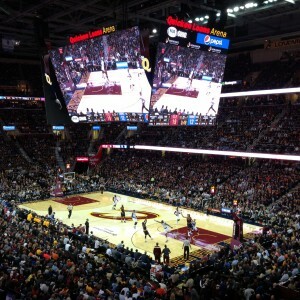 The new scoreboard, the “Humungotron” , even though it had a few malfunctions last night, is awesome! It’s high def, crystal clear video from all angles. 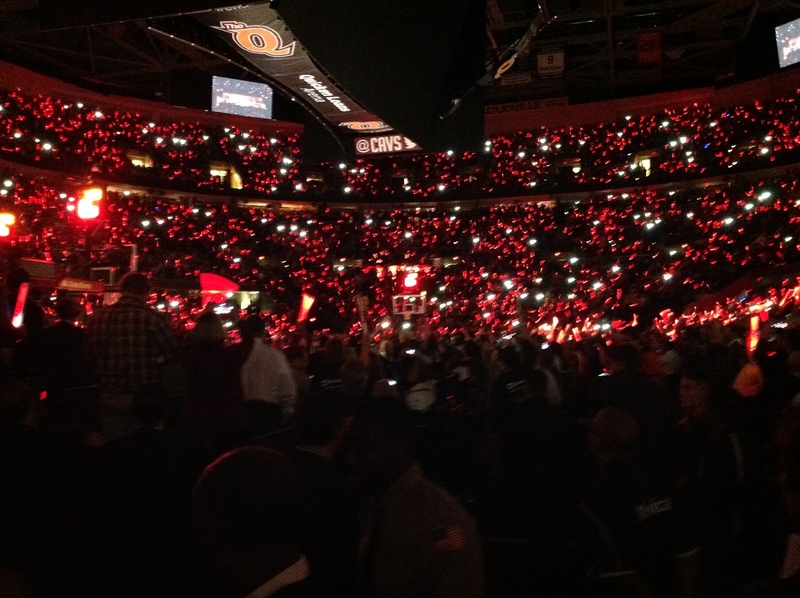 Sources tell me that the “Humungotron” and all the LED lights that were put up around the arena cost over $9 million dollars. 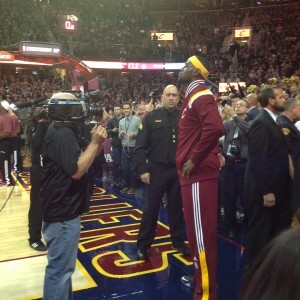 The player introductions were great and when LeBron James was announced it blew the lid off of Quicken Loans Arean. No matter who you were, it was hard not to get caught up in the emotion of the LeBron intro and just everything the entire night was about and that was before the game even started. 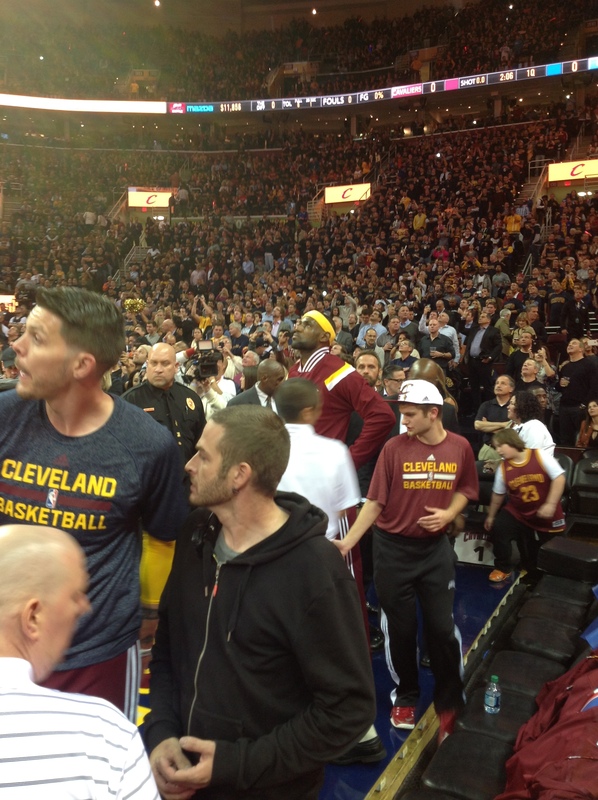 Lost in LeBron’s return was how well Kevin Love played in his first game as a Cavalier. 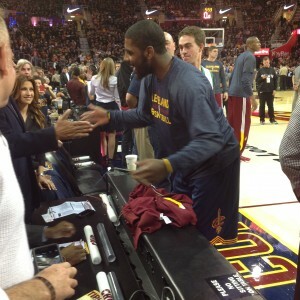 He was the team’s best player on the floor versus Knicks, scoring 19 points and grabbing 14 rebounds. He’s a double/double machine and is going to be great playing alongside LeBron and Kyrie when they get this thing figured out. 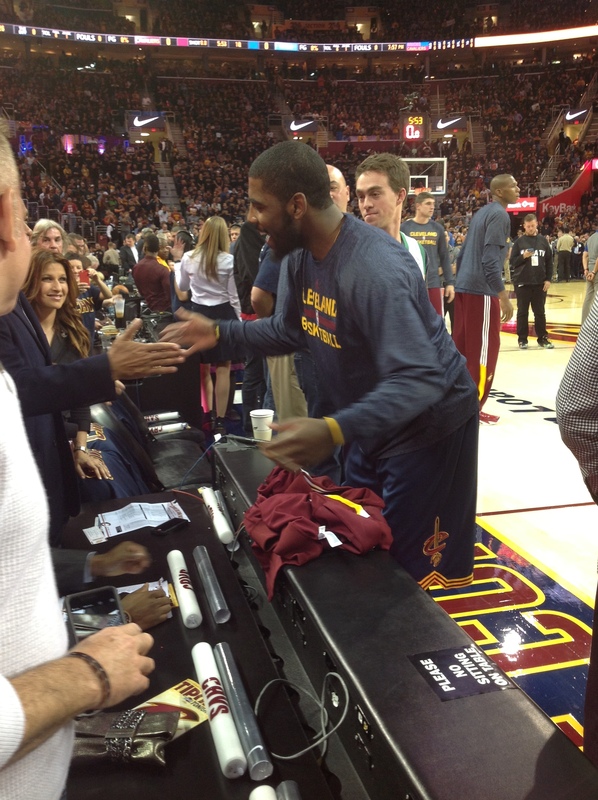 Kyrie Irving was pretty good too. He led the team in scoring with 22 points, while also dishing out 7 assists and grabbing 5 rebounds. However even he admitted last night that at times the offense became stagnant and lacked ball movement because of him and that affected his teammates. David Blatt did not have a good first game and he admitted that in his postgame press conference. Blatt knew after the fact that playing basically only 7 guys the majority of the time in game #1 was not a good coaching move. He needed to go to his bench more and not play LeBron and Kyrie 43 minutes each. 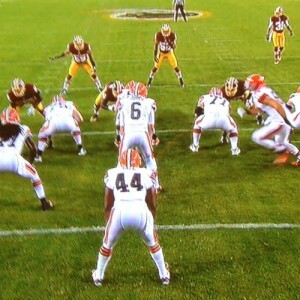 He is a rookie coach and learned a valuable lesson in his first game. It was phenomenal to be a part of that spectacle at The Q last night, but like LeBron and his teammates, we can all just move on and watch this group of new players play and grow into a team that has a chance to be very special come April, May and June. It began as a great night in Cleveland with the LeBron James returning to play for the Cavaliers, but it was Carmelo Anthony and the Knicks who stole the show defeating the the Cavs 95-90 in front of a frenetic, sellout crowd at The Q. Here’s how “The King” assessed his 5-15fg performance for 17 points with 8 turnovers at his locker after the game. 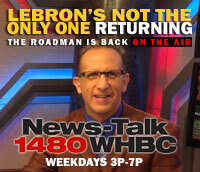 I can’t wait to get started today with my new radio gig, “The Kenny Roda Show” every Monday through Friday from 3pm-6pm on 1480 WHBC and WHBC.com. You can also download the free TuneIn Radio app so you can listen on your phone wherever you are. 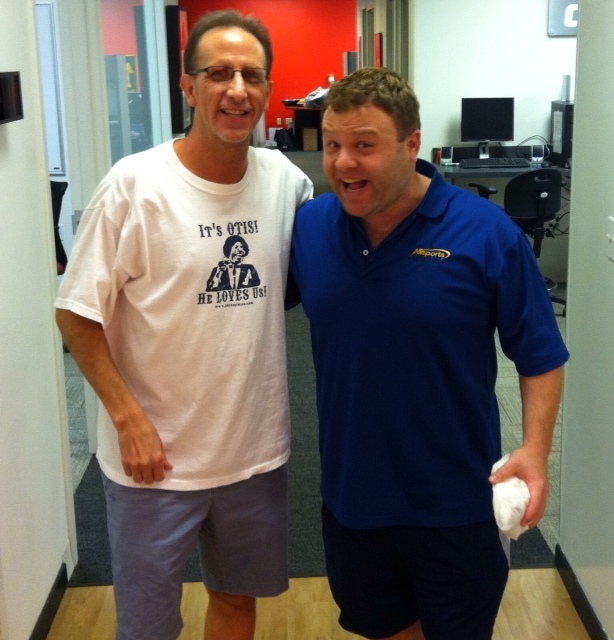 Guests scheduled to join me today for my first show are former OSU/Browns HOF wide receiver Paul Warfield, Cavs general manager David Griffin & the funniest man in America Frank Caliendo. Plus we want you to be a part of the show as well by calling (330) 450-1480. 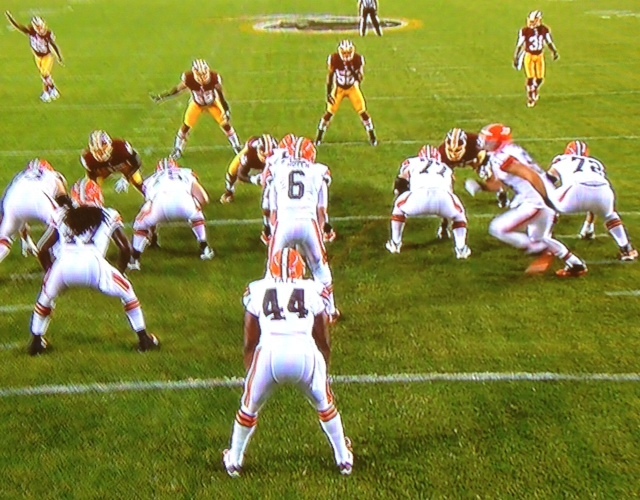 Today’s topics include how good are the Browns and Buckeyes really? What are your expectations for LeBron and the Cavs this season? Plus high school football rivalry week with Massillon versus McKinley and the playoff picture. 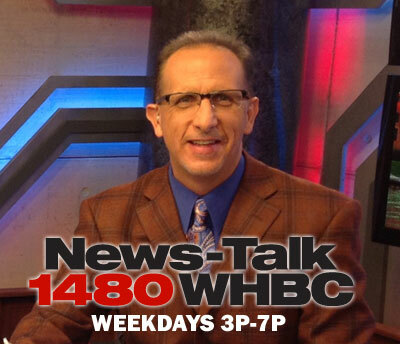 I’ll talk to you today at 3 on WHBC! 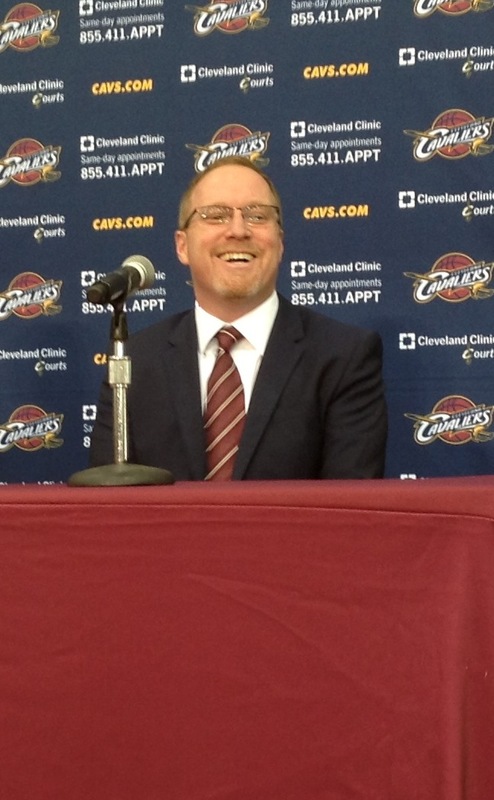 The Cleveland Cavaliers exercised the 4th-year contract option on guard Dion Waiters, Cavaliers General Manager David Griffin announced today. 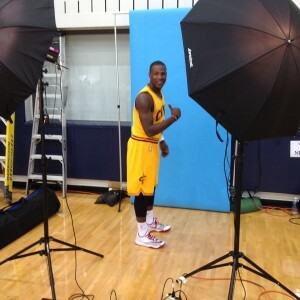 Waiters, the fourth overall pick in the 2012 draft out of Syracuse, owns career averages of 15.3 points, 2.6 rebounds and 3.0 assists in 29.2 minutes per game in 131 games (72 starts) in his two seasons with the Cavaliers. 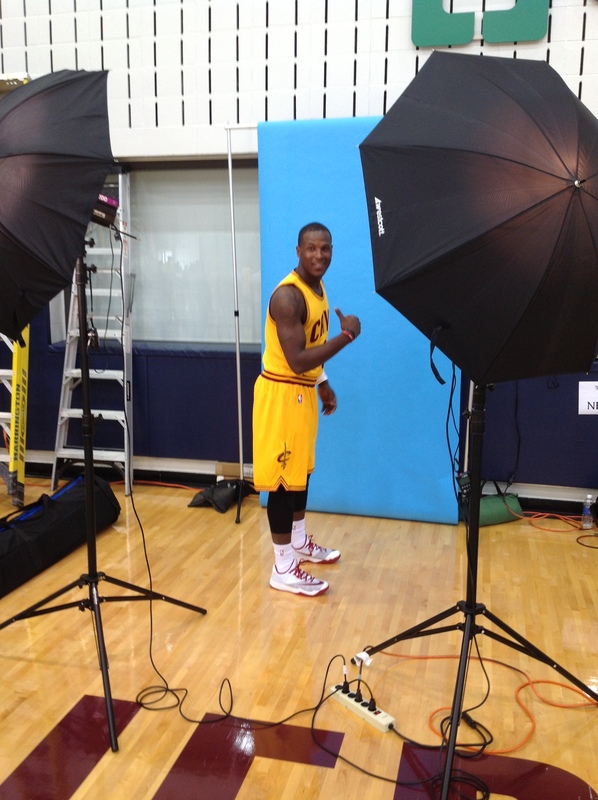 Last season Waiters scored a career high 15.9 points per game.